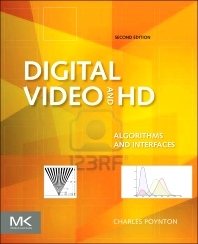 Digital Video and HD: Algorithms and Interfaces provides a one-stop shop for the theory and engineering of digital video systems. Equally accessible to video engineers and those working in computer graphics, Charles Poynton’s revision to his classic text covers emergent compression systems, including H.264 and VP8/WebM, and augments detailed information on JPEG, DVC, and MPEG-2 systems. This edition also introduces the technical aspects of file-based workflows and outlines the emerging domain of metadata, placing it in the context of digital video processing. This is a great book but it is showing its age. How about an updated edition that covers UHD and HDR? This is a wonderful book to clear up many technical aspects of digital video, as well as providing answers I have not been able to find elsewhere. I am not an engineer, just a curious individual but I still found this book very useful and interesting. A quite detailed reference for practically anything related to modern color and video standards. Charles Poynton is an independent contractor specializing in digital color imaging systems, including digital video, HDTV, and digital cinema. A Fellow of the Society of Motion Picture and Television Engineers (SMPTE), Poynton was awarded the Society’s prestigious David Sarnoff Gold Medal for his work to integrate video technology with computing and communications. Poynton is the author of the widely respected book, A Technical Introduction to Digital Video, published in 1996. Engineers (SMPTE), and in 1994 was awarded the Society's David Sarnoff Gold Medal for his work to integrate video technology with computing and communications. He is also the author of A Technical Introduction to Digital Video. is an independent contractor specializing in digital color imaging systems, including digital video, HDTV, and digital cinema. A Fellow of the Society of Motion Picture and Television Engineers (SMPTE), Poynton was awarded the Society’s prestigious David Sarnoff Gold Medal for his work to integrate video technology with computing and communications.